With a drawer that pulls out from beneath the beveled glass, the Amish Mission Large Coffee Table adds just what you're looking for to your living room furniture collection. 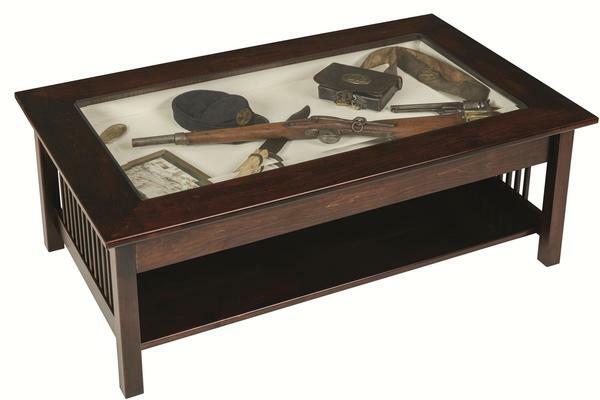 This wood coffee table lets you add your own glass case display with mementos and collections that you enjoy. Simple mission style conforms to different decor easily, making this coffee table a nice fit for many living rooms. With slatwork displayed on either side, this mission furniture is meant to be used everyday. It is handcrafted to be durable, functional and beautiful, with Amish craftsman keeping an eye on all the details that go into making it so much more than just another coffee table. This coffee table adds easily to your living room display as it works to hold reading materials or snacks when you're entertaining. Please email or call a member of our team with any questions. We can be reached toll free at 866-272-6773. For more creative tables for the living room, bedroom, and all around the house, check out our blog post, Accent Tables as Design Statements.